Here's Tyranny of Hours, another and promising female-fronted metal band leaping into the already saturated pool of similar bands. The core of the band revolves around founders Michelle Mattair, lyricist and vocalist, and guitarist Don Graham, who also handled bass and orchestration on their debut album. With little doubt comparisons will be made to bands from Nightwish to Epica to Xandria. That's not unfair and certainly not bad company to keep. ToH's take on the genre isn't much different either. This debut is synthesis of traditional melodic heavy and power metal, with progressive and symphonic notes. Mattair's vocals also veer towards the operatic side, which will likely please finds of Nightwish. Of course, what would any metal be without strong guitar leads: Graham is a sharp and inventive player. But, the inherent strength of the album lies in two areas. First, much thought and dedication have been put into crafting the arrangements. Songs like Amber (listen above), The Path That Lies Apart, Dark Symphony, and Transvaal Sphere are at once heavy, sometimes dark, but also intricate, melodic and epic. Alternatively, a quieter piece like A Breath of Peace, which features the softer side of Mattair's vocals, can be more delicate and subtle without being pretentious. Second, the production is pitch perfect; the album breathes with clarity and crispness, drawing out the nuances and flavors of every song. I'm sure Graham and Mattair had a vision as to what their debut might sound like. They should be proud of this fine debut. Easily recommended. 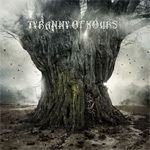 While joining the crowded field of female-fronted metal bands can be daunting, Tyranny of Hours delivers a fine album of melodic heavy and power metal with progressive and symphonic nuances.